A masterpiece in crystal and silver! With three snaps to showcase your favorite 12mm Dots and embellished with six shimmering baguette crystals, the Allure Bracelet is sure to command attention! This bracelet looks like a million dollars! The baguettes of Czech crystals are breath-taking! This gorgeous bracelet looks amazing, of course, with anything blingy. (The Solitaires are spectacular). But what a surprise to see that the natural stones, like the turquoise, are equally gorgeous! Definitely a go-to piece! This is my absolute favorite piece of Style Dots jewelry. I can make it work with any outfit - from work to weekend wear. I'm always amazed at how beautiful it is when I create the combination of Dots. This bracelet is so elegant. The baguettes give extra bling! I just love this Bracelet with the baguettes that glimmer with contracting original dots. I love the BLING Panda Dot in the middle and two contracting Dots on the side. Just Gorgeous. I love this bracelet and wear it almost every day! Love the baguette Czech crystals. They really add just the right amount of bling. I also love the rope looking detail as well! I love the baguette Crystal's and all the detailing on this gorgeous bracelet. It is my go to! Love this bracelet for the great styling it offers to your outfits. Love the baguette crystals and the roping detail that compliments so many of my favorite Dots. The toggle clasp allows the adjustment for different size wrists. Simply stunning! 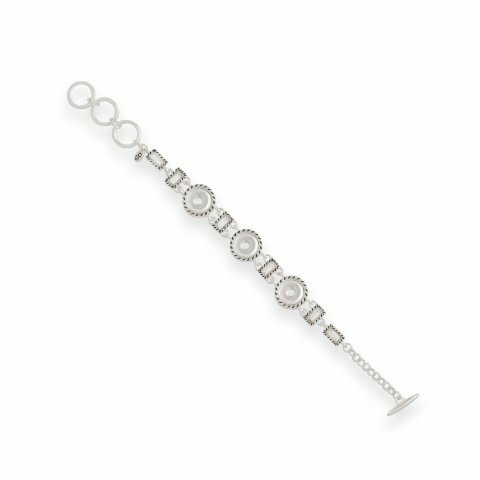 I love this Allure bracelet with space for three snap-in Dots. The baguette crystals make this a bracelet you can wear casually or on a night on the town. Beautiful with any of the amazing Dots! One of my absolute favorite bracelets. It fits well and with the 3 Dot wells, you can do so much to personalize it. Very well made and beautiful! This is one of my favorite bracelet!!! It’s elegant and dainty. I wear it when I dress up for church or dress down in jeans for a football game!!!! It’s an eye catcher for sure with all the sparkle, we ladies love!!!!!! The Allure Bracelet is Fantastic. It adjusts to all wrist sizes with the toggle Clasp. The baguette crystals enhance the original Dots. Love this bracelet with the Panda Dot and two contrasting Dots. I have this piece ( in gold ) & the necklace ( in silver ). You can wear the pieces separate or together; that is how well the two different colored metals compliment each other! If I had to pick a favorite between the two it would be the bracelet only because of the toggle closure, so easy to get on and off when the hubby is not around to help you out! I love the Allure bracelet! It's gorgeous and the versatility is great. I have a red grouping of Dots I love in it for more fancy and then some fun Dots (baseball, piano keys, anchor) for a casual look. I will be creating other looks with my growing collection of Dots! When I received this bracelet in the mail, I was so excited to see how beautiful it was. Very good quality piece! This bracelet is one of my "go to' bracelets. I wear it daily! You can achieve any look, depending on the Dots you choose. This bracelet also has a wide range of adjustability, which makes it a great choice. My FAVORITE bracelet! STUNNING!! Every time I wear it I get compliments!! I love this allure bracelet. It has a classy look with the crystals, yet a casual look with the edging. I am a country girl and this definitely fits my style. You cannot go wrong with the Allure Bracelet. Showcase your favorite three Dots beautifully with the crystal baguettes. Classy, fun and uniquely you!! I am totally in love with this piece, I have big wrists and it fits perfectly. I get compliments on top of compliments every time I wear it. An attention-getter for sure! With your choice of 3 Dots to complement your outfit and the baguette crystal embellishments, this adjustable bracelet will quickly become your favorite "arm candy!"